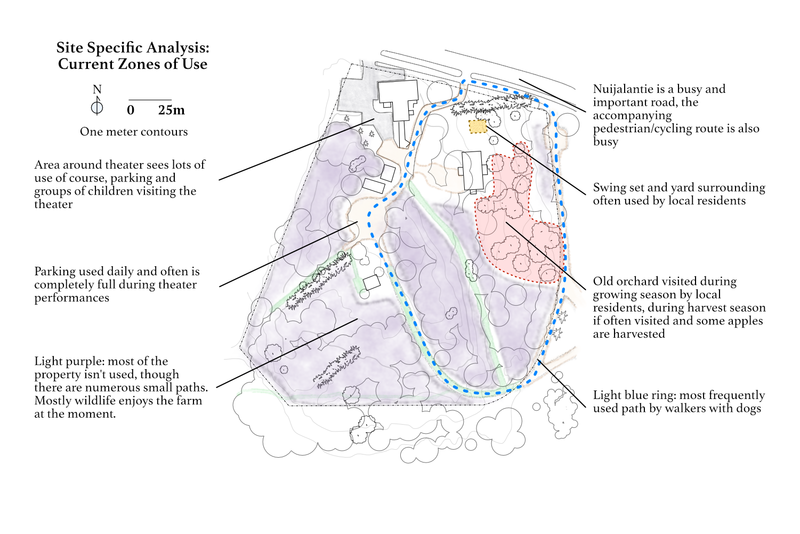 Today I will publish the diagrams and text for the last three: Soils, Current Zones of Use, and Aesthetics & Experience. 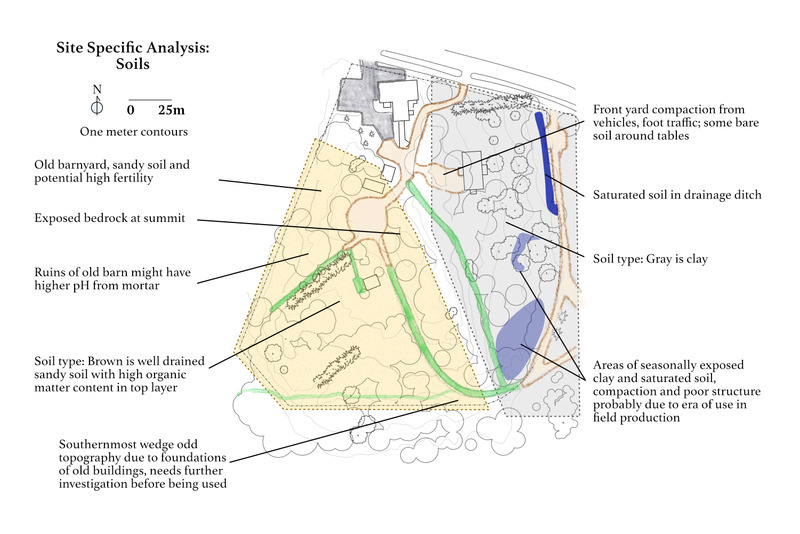 Considering the importance of soil, it may seem odd that it appears “towards the end” of a site analysis. On the other hand, soil is actually one of the easiest things to improve, if it isn’t contaminated with heavy metals, pesticides, or other persistent and dangerous pollutants. Because soil can be changed quite rapidly (in a period measured in years, rather than decades or centuries), it was placed towards the bottom of PA Yeoman’s scale of permanence, which I will examine later. Given the proximity of a major highway to Lillklobb and the prevailing winds that move the majority of the pollution from that highway across Lillklobb from the southwest, I decided early on to test the soil for heavy metal contamination. Samples were taken from the likely fields and sent to a laboratory, whose analysis showed that the soil is free from contamination of heavy metals. Other persistent pollutants may occur, as well as concentrations of heavy metals near old building foundations, but there is not any sign that heavy metal contamination is a concern. The production methods, inputs, and the design of the site itself will lend towards mitigating further pollution from the road as well as lessen the impact of any existing pollution on ecosystem health. I’ll talk more about this when we get to the design of the site. Interestingly, Lillklobb has two main soil types, divided rather neatly by the ridge. There is definitely some variation here, but these broad patterns were identified by physical examination and evaluation of the existing vegetation. On the western side, the soil is well drained and sandy. In our climate, where organic matter accumulates in undistributed soil systems, this sandy soil is high in fertility and also a boon for certain types of crops and farming systems since it drains freely, but holds enough moisture and nutrients to be productive. This side of the property has seen a high concentration of buildings, including barns and houses. This means that there is a combination of “relic” foundation sites (to be discussed later), around which the soil was treated much differently than other areas of the property. For example, the old barnyard at the northern end of this section, probably has a higher concentration of nutrients from the years of animal deposition. Growth rates and vitality of the existing vegetation hint at this. Soil depth is measured in meters in some places and much less near rocky outcrops, still, the height of the hill means that water always has somewhere easy to move. The relic sites themselves, mostly foundations, consist of mortared and bare stone. The archeologist (see the section on Current Zones of Use for more) explained that vigorous tree growth is often found right on the foundations because the lime in the mortar changes the soil pH slightly, allowing for better growth in our soils that trend acidic. Visual observation bears this out. The eastern side of the property dominated by clay. As such, it is more prone to compaction. Evidence of compaction exist and are shown by light blue circles in the old orchard. Wide herbaceous plant spacing in these areas also indicates problems with soil compaction or low fertility. The entire area outside of the main yard, the old orchard, was in field production until the latter end of the 20th century. Field production of clay, with annual tillage, can lead to lasting negative soil development impacts that need to be alleviated through design and maintenance of the future forest garden. There is also compaction around the front yard, but this is to be expected due to the amount of foot and vehicle traffic. It can also be alleviated through design and management. The drainage ditch at the eastern end of Lillklobb’s yard has the most water of any on the property, of course, and could become an interesting feature of the site through. I’ve also included the main access routes on this analysis because one can expect compaction and “fertilization” from dogs in the neighborhood that walk these paths. 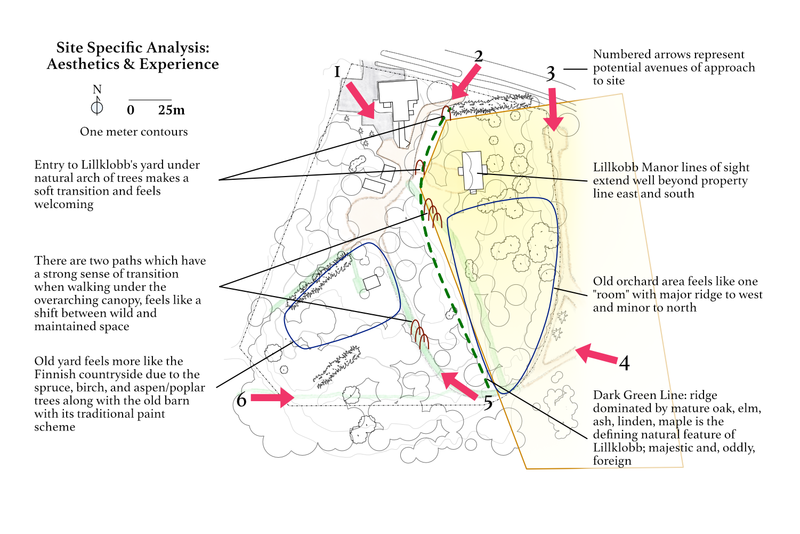 Implications of this section on site patterning will be examined in conjunction with the other analyses in the conclusion. When looking at the whole, Lillklobb is greatly underutilized. While the main house, theater, and old barns are used by the theaters, the bulk of the property- about 2 of the 2.5 hectares- is only lightly managed by the city by mowing. Other than periodic mowing, the property sees little other management. This is reflected in the graphic by the light purple shading. The yard of the main house sees some use by local residents as there is a swing set, chairs, and an attractive open space that remains- by sight anyway- hidden from view of the road. The main road, to the north, is called Nuijalantie and is an important route and is quite busy. Its accompanying pedestrian and cycling route is also frequented quite often. Indeed, most of the through traffic of local residents comes from this way, represented by the light blue dotted line- a nice circuitous pathway that serves the public well. The old orchard sees high traffic during the harvest window- with many residents coming to fill bags of apples. Otherwise, though, the orchard is not maintained and is quiet during most of the year. It should be noted that the property is owned by the city of Espoo. The Yard’s Department (separate from the Parks Department) and Cultural Department jointly share responsibility for the site. The Yard’s Department takes care of exactly that- the maintenance of the buildings, parking areas, and the yard. They also mow the open areas of the property a few times a year. The Cultural Department, on the other hand, is responsible for renting out the buildings (including the activities that take place there) and has an important say in how the site itself is supposed to be used as the property is in their name. At the same time, the Museum office is highly influential because the property has legal protection as what approximates to designation as a place of “Historical Relic of Cultural Heritage Value.” This designation, which is extended to the property immediately adjacent to the east, “Lillklobb Park,” is due to historical records indicating the existence of a medieval village. The precise location of this village is unknown. This relic status means that any developments must be approved of by the Museum department; anything including digging especially must be cleared. Additionally, the row of oaks along the southwestern boundary of the property are actually in the lot managed by the Parks department as “Lillklobb Park.” The property line does not actually follow the maintenance track, but runs in a straight line through the eastern field. These oaks and some of the meadow surrounding them were added to the area under contract as the maintenance road is a more logical and “natural” boundary for the farm. Also of note is the legality of cutting down trees/shrubs. Anything greater than 8 centimeters in diameter must have permission to be cut down. Permission must be granted from both an environmental department and the Museum. The former investigates the ecological impact (in addition to some other things like sight lines in the city and soundscape) while the latter weighs in on the cultural importance of the tree. Once permission has been granted, the city will determine if their professional lumberjacks or myself can cut the trees in question. After all this, it should be said that the contract allows me to pursue normal farming activities. The cultural relic addendum essentially says I must not move any foundation stones (preserving their ruin status) or plant any trees in the places some buried foundations were found. Otherwise I can proceed with the plans, just when in doubt I must consult the Museum. While these restrictions on tree cutting and such may sound difficult, in fact the legal protection that Lillklobb enjoys will preserve it from sale to developers and so I do not need to fear such a change. Much like describing the other conditions of the property, the aesthetics must be considered with a wide angle at this level of consideration. More detailed analysis will be conducted and described during the design phase for specifics. Nevertheless, there is a certain atmosphere and aesthetic to the place that can be talked about now. Lillklobb is like an island rising above some light industry and the highway, like a bastion of undeveloped space in the middle of the second largest city in Finland. The ridge of hardwoods- oak, elm, ash, linden, and maple that run along the ridge and define the western edge of Lillkobb’s yard are the defining, or signature “natural” (living) feature of the site. This collection of species, their age and health, are not found very often here and are quite majestic to behold. Visiting Lillklobb means arriving from one of 5 directions, with a sixth being internal but important enough to consider as an initial vantage point. These initial vantage points are consequential as their sensory input primes expectation from the site. 1: The first to consider is south off the main road and into the paved parking lot of the theater, which continues in gravel to the main house and to the summit of the hill. Visiting, I’ve always felt like the road cuts very close to the theater (a matter of meters), but the large trees spoken about before are inviting. Seeing the beautiful old barn and manor house itself sitting behind its red fence with noble trees above is pretty spectacular. Of course, one can already hear the highway from this space, but it is a low noise and not particularly distracting. 2: Arriving from the east this time, up the pedestrian path, one can really only get a good view of the side of the theater. But to reach this point, you would probably have been traveling from further east and would have seen yard and house itself in good detail beforehand. So there is a feeling of expectation when you turn the corner of the spruce hedgerow and see the trees, house, and yard for the first time up close. Entry to the yard is through natural arches made by the boughs of trees, but singular lines of them. This brief entry is quite formal and welcoming, they feel like a garden gate rather than changing places from city to country. 3: One can access the eastern side of the property if you walk down the gravel lane that has been described in other sections. From here, the drainage ditch prevents access to the main house’s yard, so you must venture down to the huge oak and elm that stand near the old sauna foundation and the orchard. This is a path that it seems most local residents take when they visit for walks. Because the gravel road is well maintained, most people stay on the track and only skirt the property. The aesthetics from here are rather impressive with the noble trees on the ridge, the yellow manor house nestled under their spread, protected and made private by the spruce, with a large orchard off to one side. Adjacent to the road eastward is “Lillklobb Park,” which is not designed for much use and gets’s mowed about the same number of times as the meadows in Lillklobb. However, there are no trees there so the heavily forested hill stands in great contrast to the surroundings. 4: You can also use this same track, arriving from the east, but from the southern route that goes along the highway. Much of the same aesthetical impact is had since you share the same vantage point, however, since the track continues to the west, one might feel like you are at the edge of the city- in marginal territory- the whole encounter with the property, since you don’t come very close to any buildings. 5: This is the “sixth” point spoken of before that is internal. When you are on the same track from 4 heading west to 6, the path continues in a loops northwestward. The forested canopy has a thick understory of lilac that branches over the wide lane, giving view to the old barn in the center of the property. This passage has a strong transitional sense as the southern reaches of Lillklobb are rather wild, but a lilac hedge and barn convey a sense of settlement. This experience is quite positive, going both ways even, and should be enhanced if possible. 6: The last way most people enter Lillkobb is from the southwest heading east along a small track through the forest. Described earlier, this area has some very tall aspen/poplar in a thick stand that gives way to extremely tall birch, oak, linden, and maple. The feeling here is that, given the forest’s continuation to the north, that you are on the edge of a vast forest (which isn’t quite true), and it feels lost to time. In addition to these points, there are some other things to consider at this site level evaluation. First, the old yard by the barn has a distinctly rural Finland feel to it with the traditional paint scheme of the barn, the spruce, birch, and aspen trees. It feels a lot like my family’s summer cottage, which has a sauna painted much the same (and about the same size) that is also bound by a spruce hedgerow and has many maples as well. The size of this old yard is quite large, but it feels much smaller due to the height of the trees and the knowledge that the sunlight there in the summer can only last a few weeks before the shadows take it again in autumn. Next, the lines of sight from Lillklobb itself are quite important to consider. Quite a few people work in the building and what they experience when they look outdoors matters. Additionally, the building sees use from other social circles and their experience of the place is also important. Views to the north and west and particularly constrained by the hedges and tall trees, which also conveniently conceal the main road to the north. Looking east and south, however, one can see across park and into the light industry (along with the high voltage lines) and commercial buildings. Before one gets that far, however, the entire yard is in good view (especially from the second story balcony) and even the old orchard is easy enough to survey. The old orchard in particular feels like one large room due to the ridge and trees on one side and the oaks and road on the other. A smaller ridge along the edge of the yard, with its apples and plums, also hem this spot in (though views from the house are not really changed by those trees). This whole eastern side of the property has a lot of exposure to the public and this has informed decision making about which patterns will be implemented there. Additionally, it should be noted that the sound from the main highway only really becomes disharmonious in the areas immediately around where the arrows numbered 5 and 6 are, otherwise, it may be loud but certainly not enough to impair enjoyment of the property if one is interested enough. Overall, Lillklobb feels, as someone with an interest in human interaction with places, like a place in waiting. It has many elements of sensory interest and a deep sense of time. Slow down and look and you will see the foundations of buildings that may have been laid hundreds of years in the past, indeed even the remaining buildings have histories that go back well past the 19th century. My greatest impression is that there already exists an excellent framework which can be refined and added to that would make Lillklobb a kind of magnet for visitors to experience history, culture, and dynamic landscape use. These elements, particularly the ridge line trees and beautiful old buildings, are extremely valuable due to their age: things like this simply aren’t built anymore and they can serve quite well even in the 21st century.